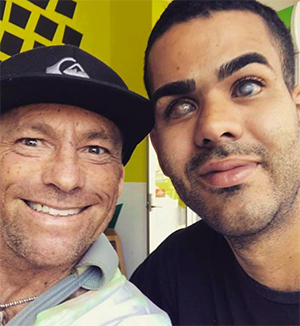 Blind professional surfer Derek Rabelo is set to launch his biography in 2019 with Ark House. Derek, pictured above with two times world surfing champion, Tom Carroll, has been working tirelessly on the book over the last 24 months. Beyond These Eyes is written by Lynn Goldsmith, one of the editors at Initiate Media, this book is the story of one of the most inspiring, courageous and incredible young men to be living on our planet at this time in history. Professional surfer Derek Rabelo is fearless in the ocean. The unique characteristic of this young man, though, is that he is blind, having been born with congenital glaucoma. He is famous for his big wave courage, riding life-threatening monsters at Pipeline, Jaws and Mavericks in Northern California, and most recently surfing 50-foot waves in Nazare, Portugal. This is an unbelievable attempt for anyone, but a miracle if you are blind. Beyond These Eyes takes you on an extraordinary journey of Derek’s life. From the time of his birth, the anguish and then devotion and love of his family, to his time now as a married man and his devotion to his wife, Madeline. His strong faith and love for God has enabled him to achieve the miraculous. Derek tours the world to speak to people of all ages to encourage and inspire them to take the limitations off their thinking.